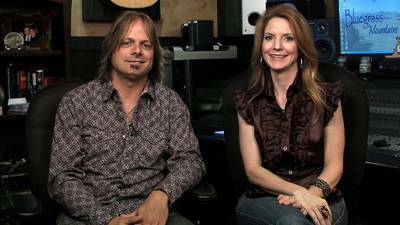 Nashville, TN (April 30, 2012) -- Award-winning brother/sister Bluegrass duo, THE ROYS, whose own TV show will begin airing this Fall, took a break from their hectic schedule recently to tape seven episodes of the new International television show, Bluegrass Mountains. Shot at Lee Roy's recording studio, the one-of-a-kind series is a CJM Productions' offering (Inside Music Row, Music Row Profiles, Soundcheck), which debuts May 1 in New Zealand on Country 99 TV. In June, outlets CMC Australia and Sky TV (U.K.) will follow bringing the count of potential viewers for the 13-episode season to 20 million. The 30-minute program features new and vintage videos from established artists like Dolly Parton, Alison Krauss and Rhonda Vincent, plus clips by newer artists like Cumberland River Band and Carrie Hassler & Hard Rain. "This is a natural extension to our other music-based programming," says the show's Executive Producer Jeff Moseley. "Bluegrass is an incredible and underserved music genre, so this is a win-win situation for all of us and the fans." Bluegrass Mountains' Producer/Director Brian Covert believes that "having entertainers host the show gives viewers opportunities to hear stories about the videos that they otherwise would not. That gives fans a very personal and intimate insight." For Lee and Elaine the tapings were doubly exciting. "The chance to revisit some great, early music videos was inspiring," states Elaine. "And, we are in very good company as hosts," jokes Lee. "Marty Raybon and The Grascals host the first season's other six episodes." With their hosting duties completed, THE ROYS headed out to entertain daily at Arizona Country Thunder, where they performed for the 80,000 fans gathered during the four-day event. Now, Lee and Elaine are back on the road, booked at Festivals and Fairs through year's end. Their newest International single release, "Trailblazer," hits programmers' desks tomorrow via the HotDisc compilation. Two-time Inspirational Country Music Duo of the Year, THE ROYS come from a unique musical family and are known for their superb sibling harmonies, "rootsy" sound and compelling original songs. Their current CD, LONESOME WHISTLE (Rural Rhythm Records), debuted at #7 on BILLBOARD's Bluegrass Albums Chart, and combines the best of Bluegrass music's traditions with the promise of its future. THE ROYS have shared the stage with George Jones, Lady Antebellum, Janie Fricke, The Oak Ridge Boys and Chris Young among others, and they've toured extensively throughout the U.S. and Canada, and made their debut in Australia this past January. The duo has enjoyed high-profile national TV gigs such as Jerry Lewis' annual Labor Day Telethon, and last year they appeared on ABC, FOX, GAC, RFD and more. In April, the siblings co-hosted Christmas 4 Kids Celebrity Golf Tournament with Tennessee Titans' Placekicker Rob Bironas. They were named 2011 Inspirational Bluegrass Artist of the Year (ICM Faith, Family & Country Awards) and were previously honored with the ICM's Duo of the Year Award in 2010 and 2009. They are featured in the 2012 Vietti Vinyl campaign and appear on 500,000 cans of the brand's Family Style Beef Stew sold in Family Dollar stores in 25 states. THE ROYS are also spokespersons for COMPASSION INTERNATIONAL, a child advocacy ministry. Inside Music Row executive producer Jeff Moseley founded CJM Productions in 1983. The company's television series and specials have included Music Row Profiles (now in its 27th year), On Solid Rock, Southern Psalms, Soundcheck, Fantasy Vacation, 25 Years Around the World with The Bellamy Brothers, An Evening with The Gatlin Brothers, Legends Fest and the gospel music specials CrabbFest and The 40th Annual Brumley Sing. CJM Productions launches Bluegrass Mountains on May 1.